When Bell Laboratories wrapped up work on the transistor in 1948, they let 25 employees vote on the name. And for some reason, those stodgy bastards passed up options such as the crystal triode and the iotatron. Sad face. According to Adafruit, the transistor was originally referred to as a semiconductor triode, but Bell Labs wanted a shorter name. 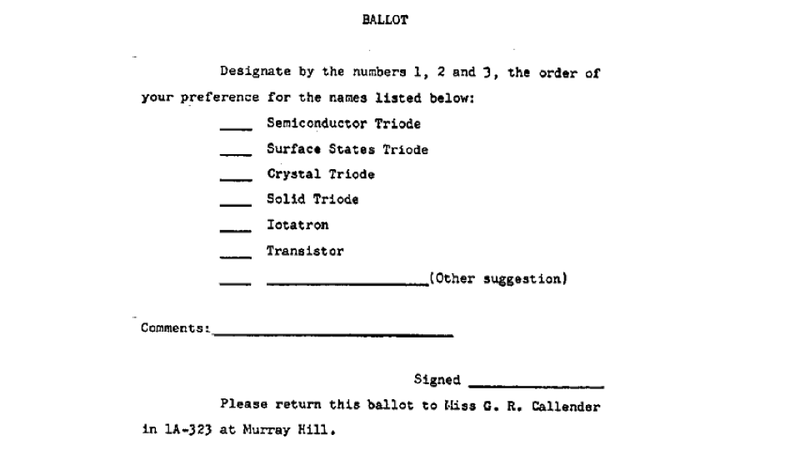 Offering their thoughts on the pros and cons of each name on the ballot, the ballot authors felt crystal triode was misleading (it needed to be piezo-electric for the name to ring true, apparently), and iotatron would not properly distinguish it from gas-filled devices. Of course, they had no issues with transistor as a name. And it was so.